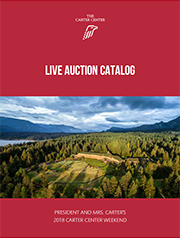 The Carter Center raised $3,524,890 at its annual Carter Center Weekend Auction on June 30, held this year at Skamania Lodge in Washington state. In addition to the auction totals, $600,000 was raised at the event for the Carter Center Mental Health Program and $75,000 for the Access to Information Program, bringing the grand total of the weekend to $4.2 million dollars raised. All proceeds will benefit the Center’s ongoing efforts to wage peace, fight disease, and build hope in the world's poorest and most forgotten countries. Winning bids are available in the catalogs below.